One of the top requests from hour clients who are remodeling is for more storage. Sometimes that really means better storage, particularly in the kitchen. Many homes have original builders’ quality cabinetry that is inefficient: unusable corners, shallow drawers. Sound like a familiar story? Kitchen and cabinet designers are constantly coming up with solutions to make working in your kitchen easier and more functional. Your home may be reaching an age where it’s time to remodel the kitchen. Below are a few suggestions to consider that could maximize storage, improve functionality, and generally make your life run a little smoother. Who doesn’t want that? Tired of rummaging around for the right pan in a cabinet? Don’t even mention finding the matching lid! Deep double drawers help keep your stacks neat and accessible and the lids in check. This clever utensil pull-out keeps cooking tools conveniently at hand. 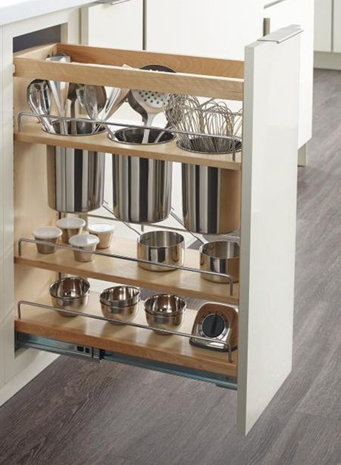 A peg system allows dishes to be placed in a base cabinet for easier lifting and organization. Sturdy slides under the drawer can support up to 150 pounds, so heavy plates are no problem. This can be located close to the dishwasher for ease of loading and unloading. No space for a walk-in pantry? Losing food at the back of deep shelves? No problem. 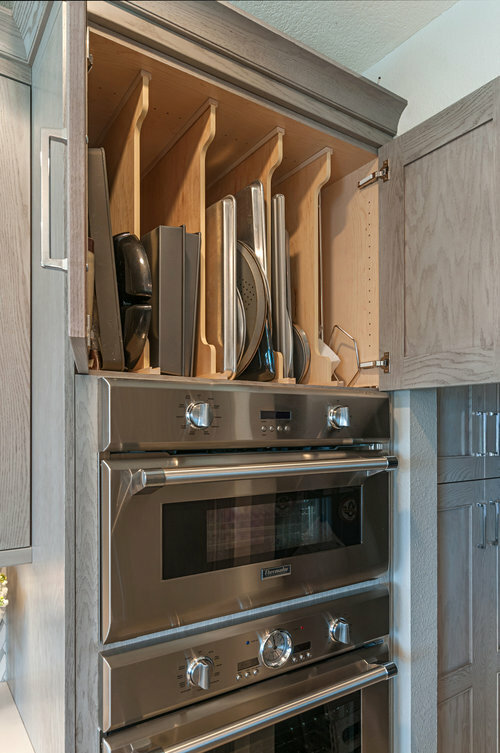 Tall pullouts and drawers/ shelves of varying sizes which allow for a variety of food storage needs. Corners are a particularly annoying storage spot in the kitchen. Take a look at this super tricked out corner pull out….almost makes you want to open it just for fun! 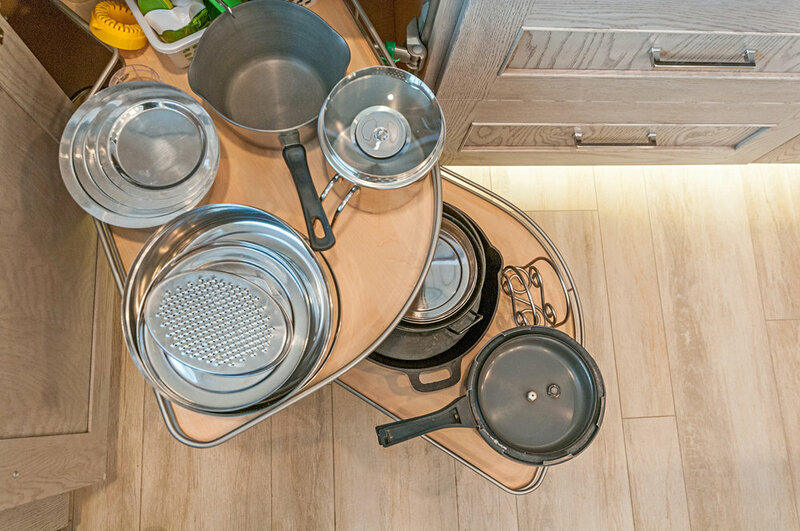 What at great spot to store narrow items that you don’t want to stack: platters, cookie sheets and other bakeware/serving dishes. You know we all have it, but we don’t want to see it. Stuff that piles up on the counter tops and multiplies like rabbits. And you can never find those keys when you want them. Carve out a little space for a message center in your kitchen. A new kitchen can be a fun and exciting project. There are many great new products available and inspirational images are everywhere. Maybe it’s time to evaluate your kitchen and develop a plan to turn it into a space that makes preparing meals a pleasure and frees you up to do more of what you love……like relaxing in your “California Room,” but that’s a story for another article!